NIA CHARLESTOWN NEVIS (January 20, 2017) — Deputy Premier of Nevis and Minister responsible for Youth Hon. 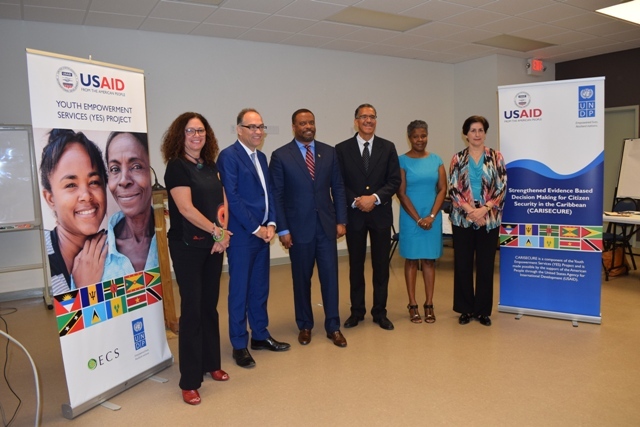 Mark Brantley said he is heartened by a United Nations Development Programme (UNDP) and Organisation of Eastern Caribbean States (OECS) project addressing critical issues of youth crime and violence, which was launched on Nevis. He referred to it as a timely and important one for Nevis. 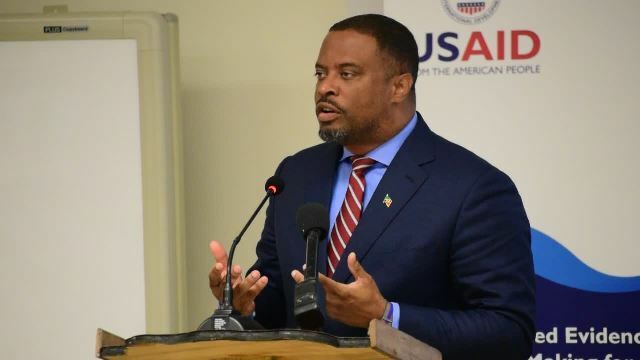 Mr. Brantley who was delivering the feature address at the launch of the Strengthening Evidenced Based Decision Making for Citizen Security in the Caribbean (CARISECURE) two-day Inception Workshop – Nevis, sponsored by the United States Agency for International Development (USAID) and UNDP. The event took place on January 19, 2017, at the Nevis Disaster Management Department at Long Point. “Strengthening Evidenced Based Decision Making for Citizen Security in the Caribbean, is most welcomed at this time, when our societies are plagued with rising statistics of crime and violence perpetuated, for the most part, by the youth. “Tackling youth crime and violence is a major priority for my government, because as expressed by Premier Amory in his 2017 New Year’s address, ‘Crime is the biggest challenge our nation has ever faced’ and therefore, the government is committed to redoubling our efforts to control it,” he said. Mr. Brantley registered satisfaction that the project would not only benefit members of the OECS grouping but also countries in the Southern Caribbean who are also facing the challenge of youth crime and violence. He noted that the project is expected to contribute to the establishment of well-coordinated functioning multi-sectoral networks at the policymaking level. The Minister referred to a 2012 UNDP Caribbean Development Report which found that crime has become one of the major challenges affecting economies and livelihoods in the Caribbean and that elevated rates of crime and insecurity are related to a limited range of human choice. He said the study also reveals that some of the most common manifestations of insecurity in the region is related to youth violence, gangs and gender-based violence. Mr. Brantley stated, that Nevis could identify with those findings and in an effort to boost its efforts, the Nevis Island Administration welcomes all it could learn about citizen security, the most results-oriented measures available to combat crime and violence and essential policy advice on how to better address the needs of the youth population, in its quest to improve the quality of life on the island. He urged those attending the workshop to learn all they could so that they could return to their respective organisations to impart their new found knowledge with their colleagues as they all work collaboratively to create a paradigm shift regarding the issues of youth crime and violence, while creating a more peaceful society.